CRIPES members have had a commentary published in The Bulletin, the quarterly magazine of the British Ecological Society. The article reviews a 2-day workshop on project management and funding applications held at London’s Natural History Museum in December 2013. The workshop was organised by members the BES Special Interest Groups, Parasites & Pathogens and Tropical Ecology, and was attended by 38 early career researchers, from first-year PhD students through to post-docs. Stephenson J., Gillingham E., Withenshaw S. (2014). 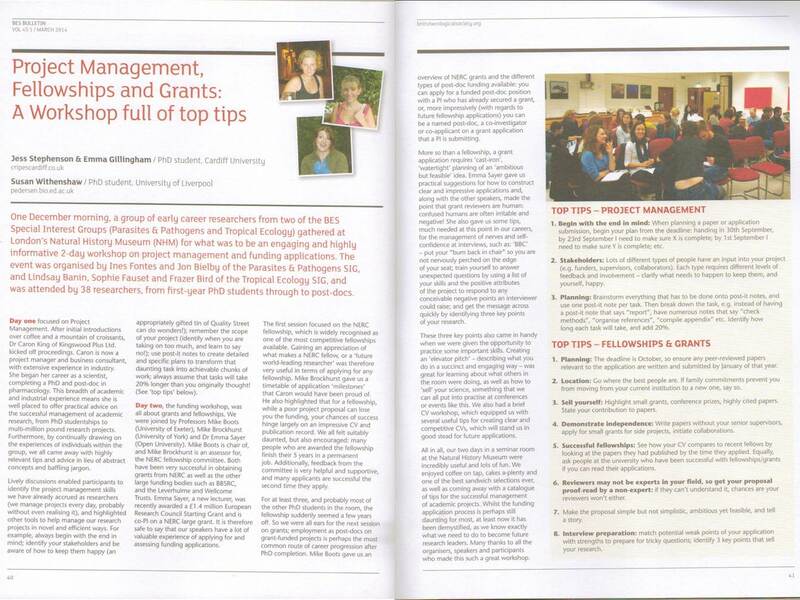 Project management, fellowships and grants: a workshop full of top tips. BES Bulletin 45 (1): 40-41. By franhockley in Latest News on March 21, 2014 .